Ariel started playing the violin at age 4. At age 9, she played bodhran in an Irish pipe band. 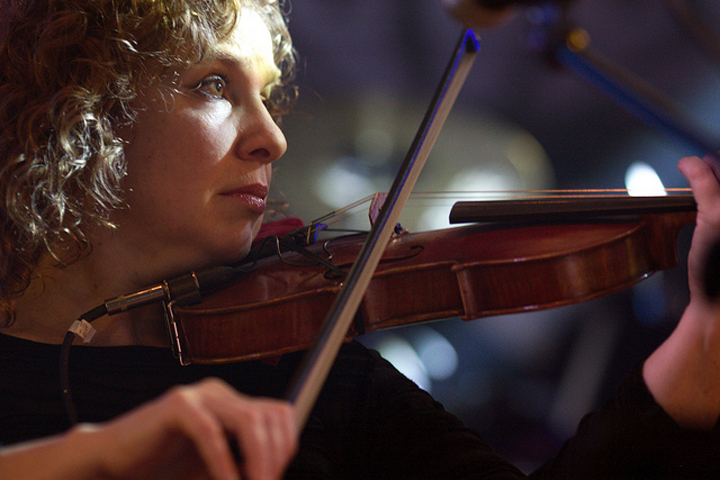 She taught fiddle at the Irish Arts Center and played in its Ceili band and productions of “Siamsa”. Ariel has been singing in a chorus from fourth grade until now. Years (and many chorales) later, she formed a band with Phideaux Xavier called The SunMachine. She attended NYU, Columbia University, and Pratt Institute, all only a stone's throw from her birthplace. Flashing forward, Ariel is a art teacher in New York and lives in a small town on the Hudson River where she and Phideaux grew up. She has two musical children, one dear old cat, and one turtle. When not helping small and large children to realize their artistic and musical potentials, Ariel and her cat listen to the birds sing, and dream of a more peaceful world.